If a certain Russian stoolie now stands little chance of thumbing a ride along the highway, he has Renee Walker to blame. At the close of 24‘s two-night, four-hour Season 8 premiere, the FBI’s onetime golden child “pulled a Bauer,” employing an electric saw to lop off a thug’s thumb and thus wriggle off a wrist monitor. The moment even caught Jack himself by surprise. Besides, since Renee is no longer employed by the feds and is simply helping CTU hunt down a Russian crime lord as some sort of patriotic solid, “She’s got nothing to lose,” Wersching notes. Has Renee gone off the deep end since the traumatic events of Season 7? 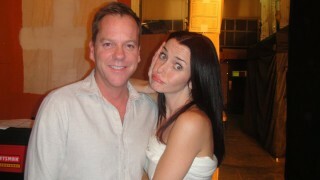 Or has she simply adopted Jack Bauer’s Machiavellian M.O.? As a by-the-book FBI agent, Renee spent much of Season 7 trying to reign in Jack’s extreme measures, but ultimately was moved to try her own hand at torturing a suspect in the finale. Crossing that line, this season has told us, plunged her into a dark place – not one that’s pitch-black, mind you, but just morally charcoal. Though many 24 fans last season clamored for Jack and Renee to take at least a tiny step toward romance, the most they got was a season-finale cuddle. Could their reunion under new emotionally taxing circumstances ultimately lead them to that place? Fox’s 24 airs Mondays at 9/8c.